Nothing is more enjoyable around your home than a gorgeous landscape. There are so many styles and designs and each is unique to its owner. When you start considering your design and the elements you want to incorporate, there are several things you need to keep in mind. These are especially important for multi-leveled landscapes that have sloping terrains or areas you want to create that are sunken and lower than other levels. You also need to consider focal points for elevated patios and even flat land. Just because your property is flat doesn’t mean it won’t have focal points. Designing your landscape can be as enjoyable as creating it and using the finished product. In fact, many people ejoy the design process much more than the actual work, but don’t forget to enjoy the work part too. This is when your design plans really start coming together. Survey the topography of your area and ask yourself if you will you keep existing plants, walkways, buildings or other elements in your yard? Can you keep those existing elements so they are attractive, functional or can be enhanced? What areas do you need to put off until later? How many stages will your overall design include? Will you work in sections or can you do it randomly? Can you live with your design for many years? 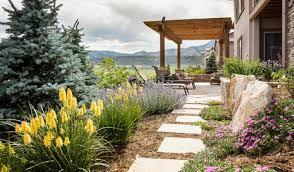 Assess elements that you’d like to have with the elements you currently have available or the ones you plan to keep in the new landscape design. Keep perspective in mind. Try to envision your design from all areas and all angles, even overhead. Also keep in mind how it will look at eye level. Stand in various locations and look across your landscape so you can get an idea of how it might look. You will want to incorporate and take into account all levels of your area, especially if it has multi-levels. If you have or go with a multi-leveled landscape, there will be roughly three levels you need to consider; higher levels, ground or eye levels and lower levels. Will you have focal points that separate each area, but add depth and beauty to the surrounding landscape? You may need to spend a fair amount of time and scrutinize over things like the foreground, the mid-ground and the background. All of these elements will be in view from where you stand. This is why you need to look at everything from all angles and keep these details in mind. Color and shade are other elements you need to consider before and during your design. This will be determined by how the sun travels over your yard each day. You need to spend a few days paying attention to the sun and shadows at different times of day and evaluate your findings. Other elements like windbreaks should be considered too. Can you create a nice backdrop using a windbreak? Texture is also an important element in your landscaping design. Some people opt for several textures and blend them together, while others like to keep it as simple as possible.